Captain Maeda, Katsuhito (surname first) by Haruki-kun, and Kira and Nico by Zarah. Katsu wears the face of a boy, maybe sixteen or seventeen years of age, with dark, long, unruly hair the left side of his bangs drooping close to his eye sometimes getting in the way. He wears the standard Hakama with the number three painted across the back in chinese characters to suggest his position as well as a bamboo hat which does nothing to improve his melancholy appearance. His hip is adorned with an ornate sheath aparently for a wider blade than most that contains a jagged blade resembling a lightning bolt pattern on the edge. He walks with the swift gait of a man with purpose and has a resolve in his dark orbs to match. Long before he'd even become part of the Gotei 13, Katsuhito was an urchin in the streets of Rukongai. He had a small group of friends whom he lived with, and shared with. Obviously, since they were orphans they got in trouble with the elder members of Rukongai which wrought the suffering that made him despise conflict. He had two friends who had been like brother and sister to him, their names were, Shintaro and Kiku. They had to steal to survive, but this eventually became the undoing of Shintaro, when one day the two of them had found his bruised and broken form at their last rendezvous point. Hidden in the shadows were the perpetrators who intended to do the same. They leaped from their hiding places and tried to strike them. Katsu only remembers the fear of being alone and then blacking out. When he came to, the two murderers lay dead and bleeding in the rain, and his friend looked at him with fear in her eyes. Katsu then asked her, "What happened?" Suddenly comprehension rose in her face and the fear left her face, but was soon replaced with grief as she said, "I don't know... you killed them." And they both wept for their fallen friend. As they finished burying Shintaro, a man robed in black aproached them and gruffly anounced, "You two," surprised they turned, "I would like to adopt you into the Maeda family, and..." he hesitated, "to grant you training in the Shinigami Academy..." Heartily they accepted and began their new lives. They could never forget the travesty that had befallen their friend and had both been shaken by it to this day. Though this had not stopped them from finding a new relationship between eachother. They were close, and considered getting married but Kiku had still been unsure. Then he lost her. Many times they fought together, but once was different. A hollow had threatened Kiku's life and he tried to protect her, but blacked out (again) he awoke, the hollow destroyed and Kiku lay dying not a few feet from him. "Kiku you're going to be fine," he wept, for alas, he knew this was not true. Kiku knew too and from her color-ridden face she whispered, "I'm going to die aren't I, Katsu? Shh..." she put a hand to his open mouth, "I'm sure you're going to miss me...*cough* but don't let it keep you down, don't give up on life... *cough* please, for me?" Katsu, still weeping nodded and stuttered, "I-I..." "I love you, Katsu." and as she said so, she coughed up more blood, and her body grew cold. Torn and stricken by grief he vowed to stop this from happening to him or anyone else. After he was well enough to do so, he buried her next to their old friend who died in Rukongai. He then realized that his vow was unrealistic and impossible but still strove toward the goal of peace. He trained tirelessly to gain power and prestige and used it to try to ease conflict where he saw it, and still does to this day. A long katana with a razor-sharp edge with "teeth" and lines etched into the side in a similar pattern, giving it resemblance to a lightning bolt. The release has several uses. First, he can raise Raikiba's tip skyward, immediately summoning a lightning bolt from the sky, smiting foes from a distance with fair precision also allowing him to continue to do so by bringing his sword down from the same skyward alignment. By shouting "Arashi no Tore!" after releasing Raikiba, a lightning bolt crashes down into Raikiba, charging him with deadly amounts of electricity that spikes from the blade, striking foes even if the edge missed. Finally, he can throw Raikiba into the heavens shouting "Nigasena! ", but this time, lightning rains from the sky in all directions within several hundred feet for a few seconds. Using this final attack however, shatters Raikiba and leaves him exhausted and nearly defenseless and is so used only as a last resort. Raikiba's spirit manifests his electric form encasing my own. The sword dissapears and he drops to all fours and the lightning covering his body resembles the form of a leopard. 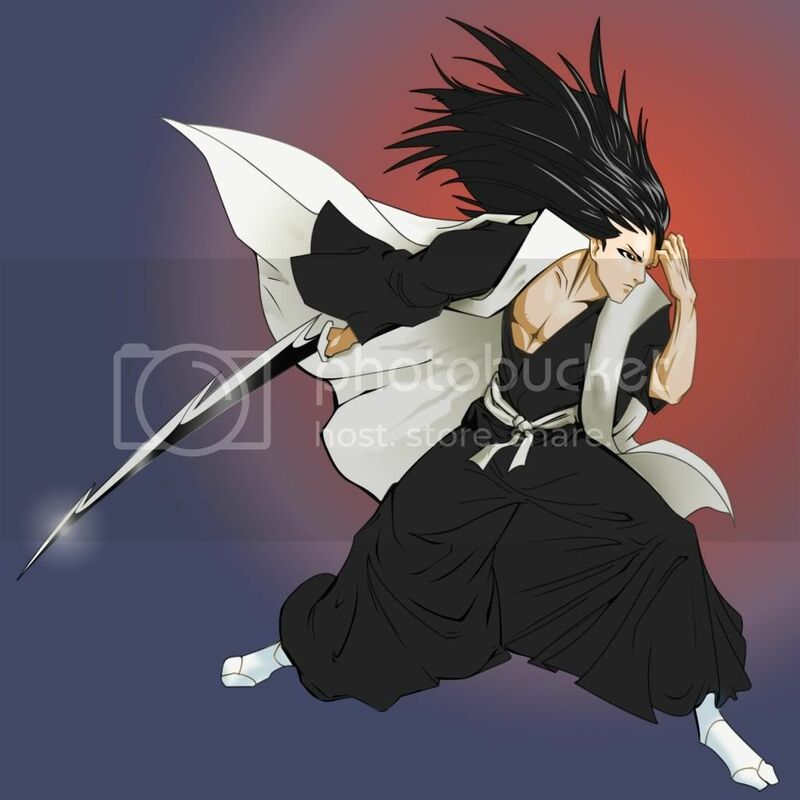 His speed increases dramatically and approaches lightspeed, however his power doesn't increase so much from the shikai form, however, using speed to his advantage he could strike his foe several times before they can amount a sufficient defense. After being stricken by lightning several times, the foe could quite possibly be immobilized. Without the use of a blade it would be impossible to activate any of the shikai abilities. An apparition of a leopard's form made formed solely from crackling electricity. Raikiba is mild-tempered but extremely decisive. He makes careful decisions and feels he has all the time in the world-due in part to his uncanny speed-to make them which is sometimes a great vice. He and I both feel a certain responsibility to this world and the next to keep the peace and will sometimes toss all that careful decision-planning through the window to protect the helpless. First off, the mindscape is a giant forest, full of places to hide. The bankai training takes is quite simply: tag. but the wielder of Raikiba can't outrun him but if his will is great, he will discover that the mindscape is only his own thoughts giving places for Raikiba to hide, and he must clear his mind before trying to find him. After which, realizing that speed is also only an illusion he can attempt to overtake Raikiba by which time, will only be a contest of wills percieved as a chase. In general, Maeda is a fairly strong kido user, capable of using low 60 level kido without incantation. His strength is further in his speed and shuunpo capability. Unarmed combat is not something he practices on too well, but he is only slightly below his level in that area. His reiatsu is also peculiar in that, it can actually electrocute foes (and friends, if left uncontrolled). He has also demonstrated the ability to absorb lightning-based attacks. Reiatsu: A lighter dark red than his cero (can't quite get it), but upon closer inspection it looks like droplets of blood unwilling to leave. Kira always keeps the pretense of insanity, hunched shoulders, a wild look in his grey eye, and constantly drooling for no apparent reason, he is regarded as crazy and unpredictable to even his peers. His shoulder-length blond/brown hair is always disheveled and dirty as is his torn hakama, in contrast to the pristineness of his fellow arrancars' robes. His mask sits on the left side of his head, also disheveled and broken, with the half of a human skull with three teeth on the bit of skull that is there he gets extremely excited and giggles and screams when he's engaged in conflict, although the stupidity portrayed especially well by his drooling and gaunt figure, is all but a ruse. Though he may be crazy, Kira isn't stupid, and it shows especially after he has a foe at his mercy, he loves to torture them. He knows what hurts people the most after watching them fight and sometimes even stalks his prey to find a way to exploit that weakness, whether it be friends, or an Achilles' heel. He loves to fight and make people suffer as long as he can before killing them, which is perhaps his greatest weakness, as he hates pain himself. Kira normally fights by aiming to disable them, at ankles, wrists, and tendons but drops it once he tastes his own blood (this usually doesn't happen due to his strong reiatsu). He then flies into a rage of fear and insanity trying to kill them as quick as he can (and if they survive only disabled, then he makes sure their deaths take as long as possible). A jagged and curved kukri that isn't sharpened well, so it inflicts more pain as his uncanny strength (unbefitting to his form) pulls it from his victim. Kira's mask becomes black as night and the jaw of his mask goes over his own, giving him the appearance that his lips melted away to show black teeth and bone which he grins stupidly through (somehow, he is still drooling though). His hakama is ripped to shreds leaving him nearly naked except for the black bone which covers his forearms and bottom of his legs. A new kukri appears in his other hand and the already jagged blade become rows of human teeth which never break completely but are already chipped. His strength increases exponentially as does his speed and he uses it to rend flesh and tries to keep from dealing lethal blows unless blood is drawn from his flesh. Segunda Etapa: "SHOSHI NO CHI WO NAGASOU, SUFRIMIENTO!" (We'll make them all bleed, Suffering!" The black bones enveloping his forearms and forelegs grow into spikes of the same dark material. His blades become one again, but this time into a string of black bones, all spikey. This mass of bones is wielded similarly to a whip, but it has a life of its own and the spikes can extend and the "whip" itself can curl and move on their own accord. Reiatsu: A yucky green with some splotches of brown. Cero: Red with little streaks of dark red mixed in. Unbecoming of Kira's appearances, the Quinta Espada sought to protect his position with three secret fraccion whom he trains himself in hidden locations. No one suspects Kira of such actions due mostly to his child-like demeanor in the presence of others. The three aprentices are unkown to eachother and all other arrancar because they carry the pretense of being weak arrancar, and usually aren't even seen as they are adept at supressing their reiatsu. Nico has long, red hair which he ties back into a ponytail. He has the clean shaven look of a man in his late 20s and a closely knit brow. Other than that, he looks like a perfectly normal Arrancar with the top half of a hyena skull, resting on his shoulder. He always had a vast amount of power, even as a hollow. Nico revels in his new form and power, but does not appreciate the training he had to go through to achieve it. He used to be extremely volatile and uncontrolled, but with the cruel methods of the Quinta Espada, he has become an efficient killing machine. The fraccion has no regard for law or order, but keeps a good amount of discipline for himself. Nico only answers to Kira, and Kira only. The only reason for this is to ensure his own growth... and survival. Abilities: "Laughing Ceros" - Nico orbits his foe using sonido, firing off quick, but powerful ceros at his opponent from his mouth as he does so. "The predator stalks his prey" - Nico uses a rapid succesion of balas and fires them at the ground. The obligatory smoke ensuing, along with his skill at suppressing his reiatsu allow him to hide and either attack at a later time, or just run away. "Predator catches prey" - Nico only uses this when he knows he's faster than his opponent and not meant to kill (or if he's just hungry). He focuses large amounts of reiatsu into his jaw and catches his foe in a jawlock. "Senka" - Shinigami technique of the same name except using sonido instead of shuunpo. This was the trademark attack of Byakuya, before Ichigo could catch up to him. Nico will use sonido to get behind his foe, and sever their "chain of fate" without them realizing what hit them. The Fraccion's posture diminishes, as he now has a hunch-back. The bones from his spine pop up as well as his ribcage fusing in. His legs and feet become like that of a hyena made of bones, and he gains abnormally large claws. To top it all off, his mask turns into the face of a hyena, with a large snout and grinning teeth, and openings only where the eyes are. The Resurreccion's true power lies in its haunting laughter. His barking laughter destabilizes the reiatsu of all who hear it, except hollows. This causes the foe's attacks to weaken as well as their defenses. Aside from this power, his strength and speed increase quite a bit and his plain zanpakuto becomes a kris. Props to Ganurath for the Resurreccion. Like Nico, Sora is a fraccion secretly apprenticed to Kira. Unlike him however, Sora has a bit more freedom to roam around and she doesn't meet with the Quinta Espada as often. Her extra freedom allows her to mingle with the other Arrancars. She is the 66 numero and was met by Kira after being born by Toho. She joined him of her own volition and as such, she doesn't resent him at all unlike Nico. She's still a little grossed out by his hygiene though. She is also similar to Kira in that she puts on an airy facade, but it is not nearly as dumb as Kira's false persona. Still, she remains to seem a little on the ditzy side. Another difference between she and the Quinta is that most other numeros already understand this about her, and lower level arrancars and hollows try to keep away from her. Sora is very attractive and a little bit on the tall side for the women in Bleachitp, standing at 5'6''. She wears her hair partially knotted high on her head, and it is bound by her mask fragment which is apparently the eye. Half of her long, pale blond hair is also black, which is a small hint at the nature of her Resurreccion. The black of her hair also covers most of the right side of her face. Her dress is a bit revealing as it exposes her shoulders and is low cut. There is also netting at the top of her dress. Zanpakuto:Sora wields a regular katana with ornate designs of the sun and moon on the hilt and guard. Sora holds her sword in front of her vertically, blade facing away then speaks the command. The mask fragment in her hair disintigrates and the colors in her hair make a definite split down the middle and in a flash of light the two halves of her body rip away from eachother. The two halves make two separate entities. Their power singularly increases severalfold but not as powerful as a normal Resurreccion. The true power of Sora's release is in their capability to fight as one. Though releasing actually fractures her personality in two, they share a powerful link which allows them to fight together very effectively and gracefully. Last edited by Krazddndfreek; 2009-11-19 at 01:23 AM.